The X-ray pictures were sent immediately to the University hospital in the city of Tromsø where the chief physician examined them. Anne-Marie was called into the hospital in Tromsø straight away, where she was informed of her illness. She was told that she had to go through an extensive operation to remove part of the colon, part of the pancreas and the upper part of the intestine. The operation was characterised as serious, and she was told to be expect a long time to get back into shape again afterwards. I felt that death was at hand and that anything could happen, Anne-Marie tells. The following weeks Anne-Marie was on a waiting list for an operation. -I knew that I needed a miracle, and I spent a lot of time reading the Bible, listening to Christian songs and reading books about healing. I felt that my faith was tested. Is this only for a selected group of people? Is healing part of the salvation package? When you are seriously ill, it is one thing to read about others getting healed, but believing that it can happen to yourself is a different matter, she says. When she found out that Svein-Magne was going to have healing seminars at an alternative health fair in Stokmarknes, Norway last winter, she decided that she wanted to go there to receive prayer. She had seen that it could give results many years prior to that. -My mother had angina and was using heart medicine. Svein-Magne Pedersen prayed for her while she was on a waiting list to get an operation in Tromsø many years ago. She ended up not needing the opperation. The hospital discovered that there was nothing wrong with her heart any more. Earlier she was severely bothered by angina pains. She has not taken heart medicine since. She is now going on her 80th year, Anne-Marie tells. 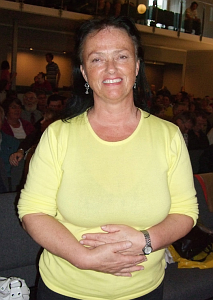 Anne-Marie went to Stokmarknes with her son Daniel, and participated in all Svein-Magne's seminars that weekend. -He prayed for me many times, and I felt warmth come from his hands. When he prayed I felt this uncontrolled muscle movement in my stomach, she decribes. When she came home after the seminar, there was a letter waiting for her from the hospital in Tromsø. There had been a change of plans. They wanted her to have another X-ray scan before the operation. Approximately two weeks later the X-ray was performed, but this time the result was different. On April 8th she was presented with the great news. -They could no longer see any tumour, but only small changes to the pancreas, she tells. -To experience being well again is amazing. I feel like my life is a gift I have received. There were some very long months filled with heaviness. You see life from a new perspective when you have had a serious diagnosis hanging over you. And you see which values are important in life, she says. -Today I see how this has strengthened my faith. To first have faith and then experience Gods confirmation, says Anne-Marie Haddal.